Neat! 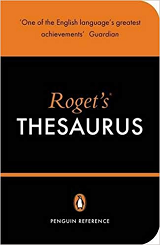 I hadn’t encountered roget as a verb, and I didn’t know about the origins of edit. Unrelated PS: Your blog system’s valid-URL detector seems to have some kind of bug; when I entered my home page URL into the “Home page” text box, it told me that the URL was invalid. Jed--The validation should be fixed. I edited your comment and added the /words URL as your site.